Sweatshirt-shiller and owner of the decidedly badass Ford RaptorTRAX Ken Block is here to perform his favorite party trick: destroying a perfectly good set of rubber treads in the name of noise, tire smoke, and all that is awesome. The haters will say this is a clothing commercial and it's lame that the truck is immobilized by a chain. 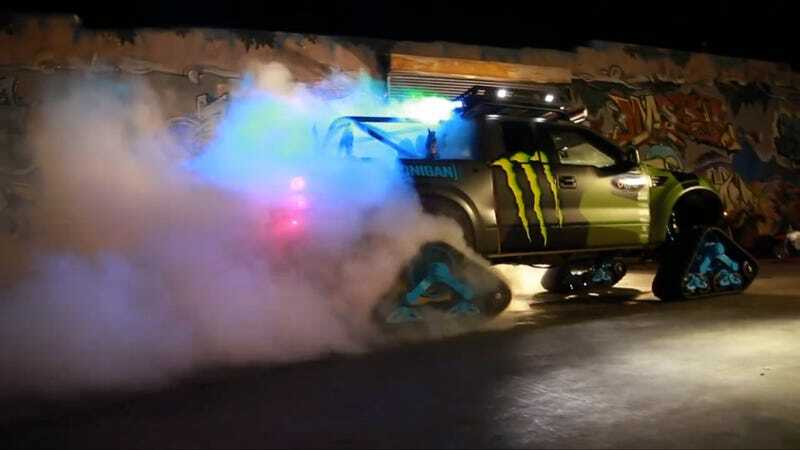 They're not completely wrong, but I'd rather bask in the amazingness that is a freaking four-tread-drive Ford Raptor burnout because shenanigans like this don't go down every day. You keep doin' you, Kenny B. Apparently there's a full-length hoon-fest featuring the RaptorTRAX coming out soon, I'm keen to see what else he gets up to in that thing.